Following its successful launch in Bahrain last week, the Zayed Sustainability Prize’s "Guiding Light" campaign has arrived in Bolivia, and will ultimately result in the donation of 2,000 solar lanterns to off-grid communities, in the Municipality of San Juan. The 20x20 metre light installation, revealing the Zayed Sustainability Prize logo, was lit up at the Unidad Educativa Sagrado Corazon 4, in San Juan; the 2017 Global High Schools category Prize Winner, reported state news agency Wam. Guiding Light is a global campaign running from December 5 to January 9 covering Bangladesh (December 18); Kenya (January 6) and, finally, the UAE (January 9). Commenting on the Guiding Light campaign’s Bolivian event, Dr Lamya Fawwaz, the director of the Zayed Sustainability Prize, said: "Following the successful launch event, in Bahrain, we have been extremely encouraged by the effect of the Guiding Light’s global campaign. 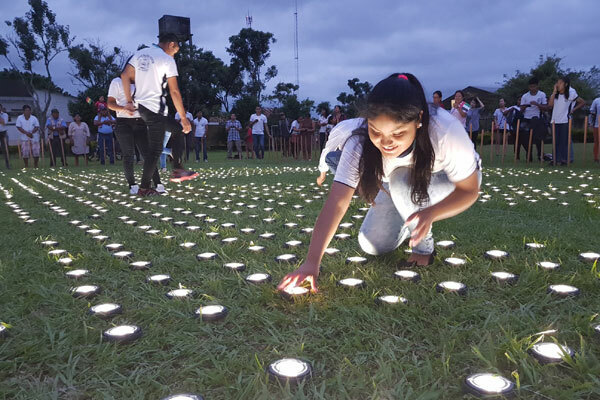 Within just 24 hours of the light installation event, in Bolivia, 2,000 solar-powered lanterns were distributed to households and communities across the Municipality, creating an immediate impact on thousands of lives." "The campaign is inspired by and is a reflection of Sheikh Zayed’s vision for global sustainability and humanitarianism and the Zayed Sustainability Prize is proud to be continuing his legacy by reaching out to new communities and impacting lives all over the world," he noted. School Director for Unidad Educativa Sagrado Corazon 4, Mercedes Almendras said: "The campaign and distribution of the solar lanterns will create greater awareness of the importance of the use of renewable resources and raise the quality of life for many families."